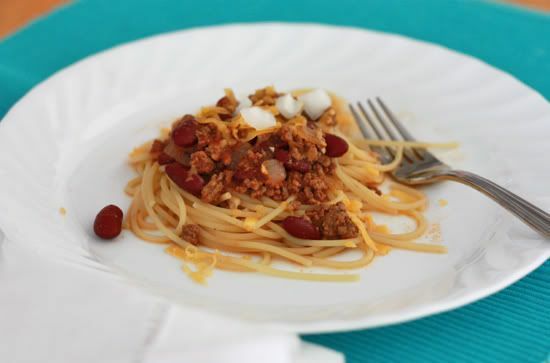 Cincinnati Chili – This Ohio ballpark classic is surprisingly easy to make at home! Find out the basic recipe, and all the ways you can serve it below! My family moved around a lot when I was growing up, a tradition I’ve continued into adulthood. I think I’m on my 13th state-to-state move (I just turned 24). Anyway, for the last 2 1/2 years of high school, my family and I lived in a teeny-tiny, itty-bitty town in Ohio. It was actually classified as a village it was so small. Just over 800 people, one stoplight, and a k-12 school. We LOVED living there. My dad once got tickets to a Cincinnati Reds game through work and he took my younger sister, brother, and I to the game. We had a box all to ourselves. My dad ordered Cincinnati Skyline chili dogs for us. They were incredible. To be honest, I don’t remember much about the baseball game, but I remember how much FUN we had up there together in a private box eating chili dogs at a major league baseball game with my dad. What makes Cincinnati chili different from other chili is the spice blend. 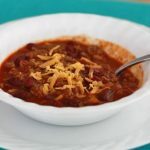 Traditionally, Cincinnati chili doesn’t have cumin (practically a staple in most chili recipes), isn’t particularly spicy, and contains a few peculiar secret ingredients. Are you ready for this? Cocoa powder and cinnamon. Sounds a little bit crazy, right? Well, don’t write it off until you’ve had a chance to taste it. It doesn’t taste chocolatey or cinnamon-y, rather it just has a little sweetness that I find perfect. We chose to picture the whole she-bang. I put my own twist on the chili, adding the beans INTO the chili mixture, rather than serving them as a garnish, but you can totally leave them out if you want to be more authentic. I just LOVED it! 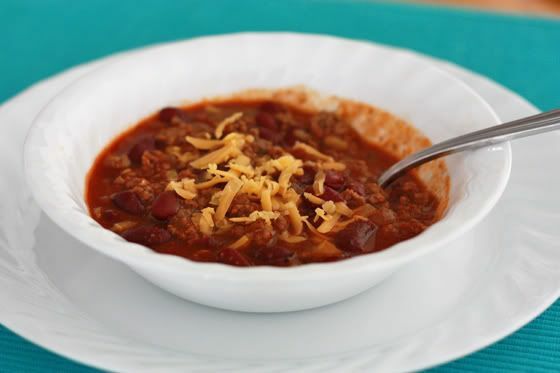 If you’re looking for a way to change up your chili night, give this one a go. It’s delicious! It freezes well and can be eaten plain, over pasta, or to make your own chili dogs. In a large pot, cook ground beef and onions in a small drizzle of olive oil and cook over medium heat until beef is cooked through and onions are tender, about 5-7 minutes. Drain any fat. Add garlic, and cook 1-2 minutes more, or until fragrant. Add chili powder, cocoa powder, brown sugar, oregano, cinnamon, allspice, and cayenne. Stir to coat beef/onion mixture. Add tomato sauce, broth, water, vinegar, and beans. Stir to combine (mixture will look rather watery). Bring chili to a boil over medium-high heat. Reduce heat to medium-low, and simmer 30-40 minutes, or until thickened and deeper in color. 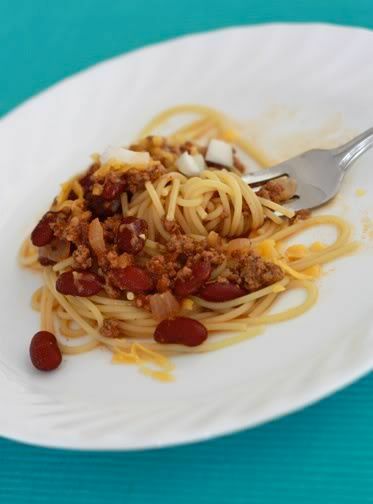 Serve over spaghetti or hot dogs with diced onion and cheese as desired. *Gluten and Dairy Free Notes: Just be sure your broth is gluten free. I like Pacific Naturals brand. I love chili! 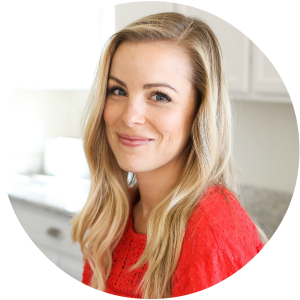 – your recipe looks wonderful….and with spaghetti even better! I live in Illinois and we have this fast food place called Steak n Shake. They sell this Cincinnati type thing but they call it Chili 3 Way, or Chili 4 Way, or Chili 5 Way. That’s why in your recipe about chili mac I mentioned that I usually use spaghetti. Growing up with Steak n Shake is where I got that idea. I didn’t know until recently it was a “thing” in Cincinnati!!! !